Throughout the book Gary creates imagines and uses metaphors to teach and make his points. And if you’re a sports fan, you’re in luck. Gary is as well. Therefore many of his metaphors are sports related….I believe baseball and basketball are his favs. The book starts with Gary’s story about the onset of his diabetes and a bit about how he has managed for now more than 30 years. But that just helps you get to know Gary. He moves quickly onto the many ways good control of diabetes can help stay healthy for both the short term (day to day) and the long term (over your many years). 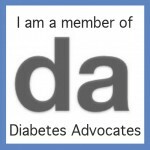 Gary gives detailed explanations of how and why type 1 and 2 diabetes develop. He also covers LADA – latent autoimmune diabetes in adults (occurring more and more frequently and often initially misdiagnosed). Gary offers great perspective and history of how the tools available to manage diabetes have changed. He knows first-hand because he has lived through much of this transformation over the past 30 years. He provides excellent descriptions (along with excellent black and white photos), graphs, charts and more about the different types of insulin and their action curves, why and how to choose certain size and type of insulin syringes, pens and pen needles. He details the history, current value and variety of glucose monitors, He brings you up to date on the variety of insulin pumps and continuous glucose monitors (CGM) on the market as well as a glimpse into future technology. Several sections are very useful for people doing intensive management, such as record keeping, data analysis, trend tracking, evaluating your basal and bolus dosing. You’ll also benefit from tips on the important topic of timing of rapid acting insulin, (or as I call it, ain’t so rapid, rapid acting insulin), and serves up tips to time this insulin to minimize post eating highs. If I fault one area of the book it’s Gary coverage of the critically important nutrition management aspects of diabetes (yes, perhaps I’m biased). In spots the content is outdated, such as on sugar substitutes and in others doesn’t completely reflect the scientific evidence, such as on glycemic index. GI is presented in a simplified manner and as an absolute system to base your food choices. Reality and science is that the impact of a food and meals (which is the way we eat) is way more complex than just using glycemic index. Thoughout Think Like a Pancreas Gary does not mislead you about the challenges of managing diabetes and insulin therapy. He makes it very clear just why it is so hard to control glucose levels and offers myriad ways to manage the many real-world situations and real life. All in all, I love this book and think it’s a terrific addition to your diabetes bookshelf if you manage your diabetes using insulin.